For more than a decade, the Internet has been called “the great equalizer.” Anyone who has access to a computer and a connection to the Internet now has the entire world at their fingertips. It bridges continents and oceans and brings people together. Since the mid-90s, when the Internet became available for use by consumers, websites containing useful information and entertainment have drawn the most views. The rapid explosion of online presence has also brought about the phenomenon of social networking. Social networking is both advanced and human. It’s advanced because it transmits information at lightning speed and it’s human because it can harness the human potential to connect, communicate, and share. Many enterprising people have also started sites that require paid membership. These sites contain information that is otherwise inaccessible to others. Discussion forums are another form of network that allows the sharing of ideas and concepts with people who have similar passions and interests. Despite the popularity of social networks, paid membership sites aren’t going away any time soon. In fact, they are expanding at an unprecedented rate with more members-only websites being started. Membership websites capitalize on the fact that people are willing to pay for any information that they find useful, and that by associating and communicating with other people who share their passions, they add to the general wealth of information and knowledge that the Internet plays host. Membership only sites charge a minimal fee, however, with membership numbers in the hundreds or thousands, they provide a steady stream of revenue for owners, advertisers, and content generators. They have also spawned an entire industry of web developers who look to create the next big thing in content and payments management. Membership sites offer a distinct advantage over those sites that offer free content. Blog entries and other content are strictly moderated, as well as the interactions between members, which helps to lessen the risk of conflict. Plus, each member feels an exclusivity that is otherwise missing in similar, more open sites. For owners of membership sites, the advantages can be summarized in two words: Cash Flow. Compared to the brick-and-mortar business, membership websites take relatively little effort to establish and have low overhead, while having almost nonexistent physical limitations. The only thing that they are limited by is the imagination of the owner and the members of the website. Owners of membership sites will find that every new member brings in not just money, but the possibility of more members coming in due to referrals. This means that the most successful membership websites find ways to constantly re-invent themselves, by introducing new content whenever they feel a change is needed. Everything, nowadays, is practically accessible on the Internet. It has replaced printed matter as the first choice for information on just about anything. With a click of the mouse, the entire wealth of human knowledge is at your disposal. Most of all, you can access it from anywhere. It is for this very reason that membership sites have come into fashion over the last decade. You may be wondering what, exactly a membership site is. Simply put, a membership site is a personal page where you can post exclusive articles, knowledge, and data about a field that strikes your fancy. With the site, you charge members a certain amount to access this exclusive data, and this, in turn, drives profit and sales. The best part of owning a membership site is that you’re the boss, you continually make money, and you get to manage a business that focuses on something that has captured your passion. Membership sites are extremely lucrative because people will always be willing to pay to get their hands on the information that they need. Rather than visiting the local library or bookstore, they can simply get on the Internet. It’s fast and convenient and it is making its way through cyberspace. Everyone has their own passion, and there are other people who share their obsession. These people are the ones that will be willing to part with their money to know more about the things that they like and love. This is the reason why membership sites rake in the profits. Membership sites that charge for content have become an exciting industry that continues to grow more profitable every day. 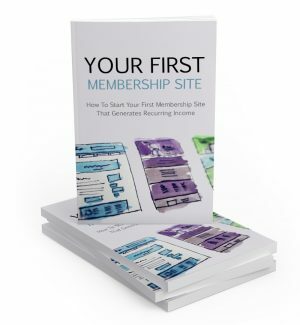 If your website has 500 members paying a monthly fee of $15 each, you will get $7,500 every month, and that’s just for a single membership site. Since these kinds of sites run on residual income, the money comes in every month as the membership fees come in. steady stream of money will continue to grow with every new member that registers. What’s more, with each site that you set up, you can add even more income to your growing business. For example, imagine you are the owner and manager of three membership sites that charge $20 per member each month. One site has 500 registered members, the second site has 200 registered members, and the third site has 100 registered members. You would make a total of $16,000 per month, or $200,000 every year. The nice part of starting and managing a membership site is that you get paid to do what you love. A lot of people manage more than 10 websites, with membership totals running in the hundreds for each. With 500 members for every site, that are paying $20 every month, the owner bring in an annual income in excess of one million dollars.